CNN and Facebook today announced plans to join together for a unique viewer engagement initiative that will extend the experience of the new CNN series, THE SIXTIES, beyond television screens for Facebook users. THE SIXTIES, a 10-part series for television executive produced by Tom Hanks, Gary Goetzman, and Mark Herzog, explores the events and people that made the 1960s an extraordinary era of change and achievement in pop culture, civil rights, politics, and technology. The enriched social media engagement will include exclusive video and social media content that will create a unique second screen experience for Facebook users. Features of the unique collaboration will include weekly live Q&A chats with historic figures and the series producers during each episode, weekly viral video content on highlights of the period, and exclusive video produced by CNN Digital Studios illustrating the achievements and events of the remarkable decade. Each week, CNN will premiere one original video on Facebook related to the series content, as well as platform other SIXTIES-related video. Also each week, CNN and Facebook will collaborate for Q&A chats with celebrities and experts related to the week’s new television content. The first Q&A chat will be hosted by Jerry Mathers, star of the television family comedy Leave It to Beaver. Producers from the series will join Mathers for a live online discussion via Facebook, beginning at 9:00pm on Thursday, May 29. CNN will also create viral content related to events, people, and achievements of the 1960s for Facebook users to share with friends. This content will be designed to be both fun and educational, with an effort to broaden the experience of the series. More information about THE SIXTIES may be found by visiting www.cnn.com/sixties. 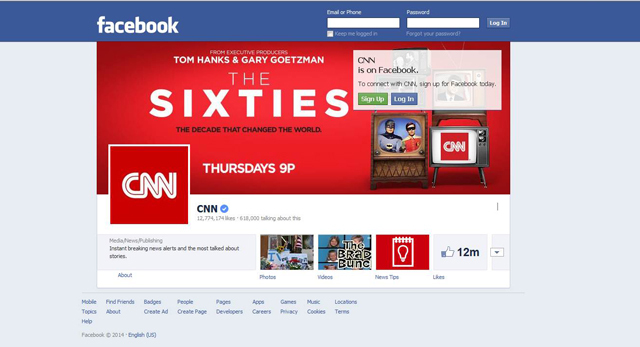 In addition to the unique Facebook engagement, viewers can also interact with producers and people who appear in THE SIXTIES via Twitter by following @TheSixtiesCNN and using #TheSixtiesCNN. The Facebook partnership is one component of a comprehensive viewer engagement campaign in support of THE SIXTIES that includes screening events, a museum-style exhibit installation, as well as radio, television, and outdoor advertising. THE SIXTIES will premiere on CNN/U.S. on Thursday, May 29, at 9:00 p.m. ET and PT and will continue on successive Thursdays through August 7.